I have been stuck behind a computer for long, torturous periods of time as of late. While much of this time is of my own doing, I needed to get out on the water. So, I annoyed Stan from False Casts and Flat Tires into heading out on a night time mission to mouse up some brown trout. 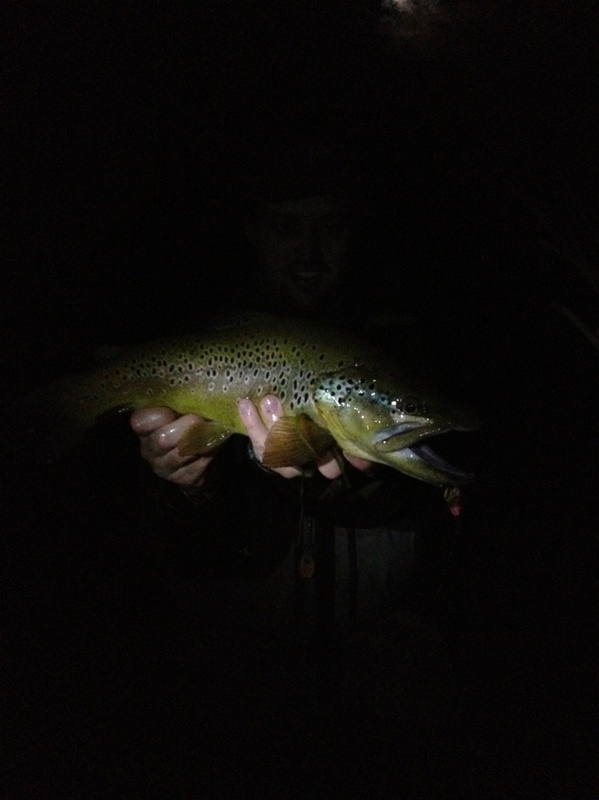 Last year, one of my goals was to catch a fish on a mouse...and catch a fish at night. I failed miserably on both accounts. Mostly due to a severe lack of commitment. The nighttimes is muchos scary, guys. Mucho muchos scary. 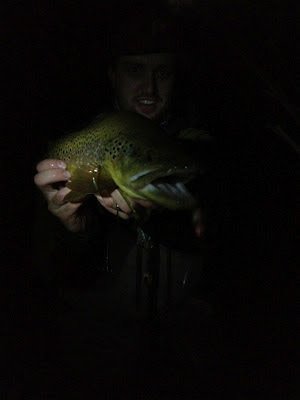 With the darkness, the lack of light, a collection of odd, unusual and threatening sounds, and bats, I didn't last long whilst trying to catch nighttime trout on the fly. In January, Andrew Grillos, signature fly tier at Idlewylde saw that my 2012 dreams and goals list still included catching a trout on a mouse. AG, is apparently the giving sort, sent me two of his BOB Gnarly patterns. Then, earlier this week, he emailed me to tell me that this week would be a good week to go mousing. That email got me out on the water by midnight and into fish by 1 in the morning last night...or this morning. 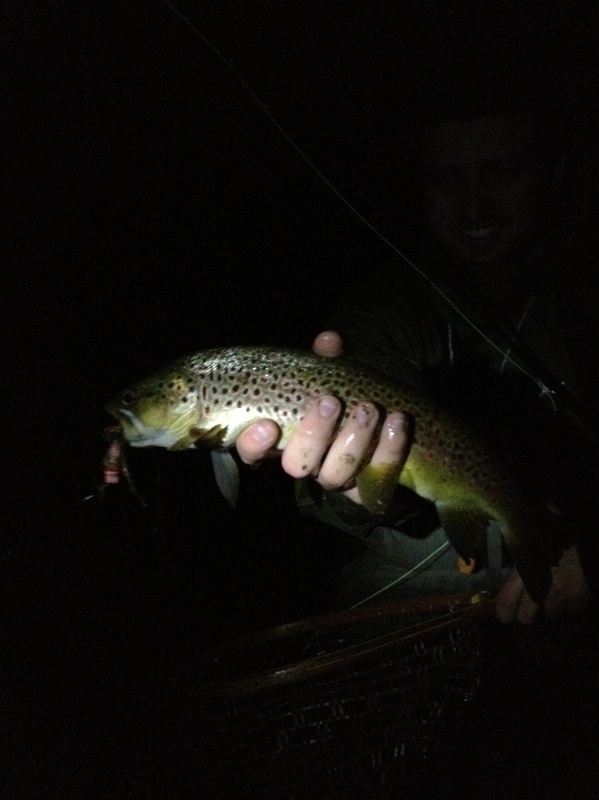 Admittedly, my first trout on a mouse was hooked as I crossed the stream with my fly trailing me downstream. More of an exercise in "skilled" wading than skilled presentation. It's not the biggest of fish by any stretch of the imagination. But, a first is a first. As we progressed upstream, Stan and I started to put pieces of the proverbial presentation puzzle together. Working upstream and casting downstream, shaking the rod tip and stripping in sporadically, We had our fair share of boils and splashy misses. As my BOB Gnarly quartered and twitched it's way downstream, my fly disappeared into the jaws of impressively proportioned 17" brown trout. It had the shoulders, head, and pseudo kype of a fish a half a foot longer. Monkey off back. Props go to AG. I feel like he Jedi guided me from a distance. great work! What did you throw the fly with? What was your leader set up? Beauty - what kind of water did you pull the brown from? that is a tank of a 17"er. You can put mousing in Alaska on your list for next year. They eat them during the day up there. Then again, it's scary during the daytime in AK. The world is full of trade offs I guess. That brownie looks like he's eaten a few mice in his day. Two checks on the bucket list; good on ya! @Lee - thank you sir. I threw with my 9 ft. 6 wt. Echo Carbon. A great rod for the price. My go to stick. Leader set up - straight 20 lb maxima from fly line to fly, 6 ft in length. Non-slip loop to the fly. GeeRam - I found the fish in the riffles, tailouts, and in soft water just upstream of big bends. They seemed to be focused in shallower water, as is typical for nocturnal browns from what i understand. @sanders - thanks man. The jedi guide definitely deserves many a compliment. @mike - indeed sir. couldn't single hand him. no chance. @gary - i know. AK or Russia. I'll just go with slower, dumber friends. is comfortable,feasible and enjoyable too. Thanks for such a organised blog that publishes different posts on fish, fishes an fishing. I expect you will keep this nice posting etc. I know night times fishing is scary but adventurous too. The pictures are great and depicting your success.